I have heard many theories regarding Bigfoot. Missing Link. Undiscovered North-American ape. Living modern branch of Gigantopithicus. Inter-dimensional time traveling monster summoned from the physics experiments during the US Government funded Montauk Project. Really, I'm a fan of all of these and thought I had heard all of these. Not True. Enter Matt Bowman. You may remember him from a previous post Is Bigfoot My Brothers Keeper? He wrote a paper published by the JOURNAL OF MORMON HISTORY VOLUME 33, NO. 3 FALL 2007. 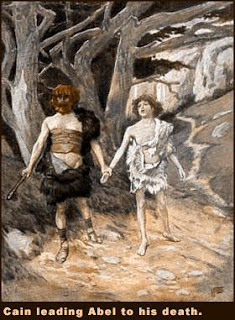 It is an article entitled A Mormon Bigfoot: David Patten’s Cain and the Concept of Evil in LDS Folklore. I will give you the Readers Digest version. Multiple historical Mormon documents reference an Bigfoot-like encounter experienced by David W. Patten. Patten was an early leader in the Latter Day Saint movement and an original member of the Quorum of the Twelve Apostles. The creature is described as a hairy man of ill smell, who claimed to be none other than Cain himself. Yes, the creature talked. Why am I bringing this up again? Because, I was a little disappointed after reading Matt Bowman's Paper. I realized there is no mention of one of the most respected BF scientists out there, Jeff Meldrum. Why would/should have Matt Bowman mentioned Jeff Meldrum? Jeff Meldrum is a BYU Alumni AND Author of the Sasquatch: Legend Meets Science. A book recognized and recommended by Jane Goodall, in fact she is quoted on the cover, "...[Sasquatch:LMS] brings a much needed level of scientific analysis to the Sasquatch-or Bigfoot-debate." Being ever diligent I have corresponded with both Matt Bowman and Jeff Meldrum. I should first say both are very gracious and kind. Although I must say Mr.Meldrum shattered my own private personal Bigfoot hypothesis, but that's another post altogether. I am aware of the primary citations, but haven't encountered Bowman's paper...I don't place any significance in Patten's "experience" for Sasquatch research, but would be interested to learn more about its historical context. Your welcome Jeff, I had a hunch as a Mormon you may have heard of David W. Patten and as a published well-recognized and respected Sasquatch researcher you may also have had something to say about the whole thing. In retrospect probably should have included something about Meldrum in the paper; I was aware of him when I did the research, but just didn't find a good place to fit him in. I've seen some of his work but have never spoken to him personally, so I'm not sure what drives his interest. Overall, though, I'd say he fits in with the trend among Mormons I describe in the paper away from a more supernatural interpretation of Bigfoot and toward an increasingly scientific approach. So there you have it mystery solved. I hope we continue to pursue the scientific explanations and leave the supernatural hokum to the fringe looneys in the field. meldrum doesn't have any interest, he merely sent you a polite reply...in which he says he places no significance in patten's "experience" (which he has enclosed in quotes, which might mean he doubts its veracity. ) if you meant to say that you didn't know the basis for his research, i would say -science. Well you know Anon, there is more substance in the 'supernatural hokum' then you realize. For example, the inter-dimensional theories are at least backed up by mainstream science. This is something we may need to come to terms with. Yes, mainstream science believes there are many different dimensions. Its known as Quantum Physics and M-Theory. So how do we know that some creatures haven't learned how to pass from one to the other? We don't. I'm not advocating this option just that IN SCIENCE, we need to be open minded. And other dimensions are part of the equation in science today. The question is, how does the bigfoot field come to terms with this? What needs to be understood is that there are also different disciplines in science. There is the Biologist and there is the Physicists. The biologists often have a hard time with Quantum Physics and String Theory. This is where we are too. It's the same with the telepathy issue. More government and university dollars have been allocated into trying to understand that phenomenon then ever has with bigfoot. While we try to harness the phenomenon, we still aren't very successful, well at least as far as is being revealed. Still the phenomenon is known to exist . These are areas of science by standards that simply haven't reached this field yet. Simple as that. Just another paradigm. And how many bigfooters have come to realize that sasquatch seem to always be one step ahead of us? Why? These are phenomenon that we can't just ignorantly cast aside because we don't understand them, or because of the equally unsupported theory that bigfoot is just an ape (Giganto) that crossed the land bridge long ago. As for Cain, I'm not inclined to believe the story because he seems to be talking about ONE bigfoot individual as being Cain when there are thousands of bigfoot. Maybe a 'descendant thereof', as just one more theory. The descendants of the Nephilim and other Biblically referenced giants are equally plausible. We just need to have an open mind sometimes and ACTUALLY explore theories, rather then dismiss them out of hand. Let's not go killing one (if we haven't already) just to prove they exist, Nor to display one to make money. Not too many people want to pay money just to see a dead stinky, hairy giant either. For information collected over thirty years that goes back in history to the age of Atlantis see my info done as a jokebook of fun and facts @ www.saveoursasquatch.com have fun and leave a pun.